Antique rugs are worth considering and are available in many beautiful designs and styles for you to look at. Within this section we focus on two of the most popular types of antique rug: the Aubusson rug (from France) and the Persian rug (from Iran, formerly Persia). Antique rugs should be professionally cleaned before assessing it's value. If possible, ask the person or the company that you are buying the item from to get it cleaned in advance. Dirt is not necessarily a bad thing, and it can sometimes even help you to get a better price out of the vendor. 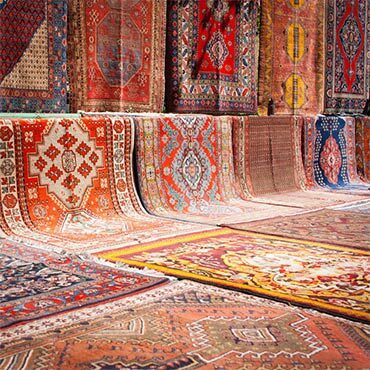 However other problems associated with antique rugs and carpets, such as excessive wear and tear, sun damage and substandard reparative work can go unnoticed if it is very dirty. With an antique rug, the more even the pile is, the better, so make sure you have a close look to see whether it is more worn on one side than another. You should also check whether the rug shows signs of previous repair work. If this is the case, check that it has been fixed properly. For example, if the repair was carried out to fix a worn area, ensure that the rug has been rewoven in a manor that is sympathetic to style and technique of the rest of the weave. If you are buying the rug over the internet, or unseen for any other reason, always ask the vender to assess the rug’s condition. This way, if you are unhappy with the product when you receive it, there is more scope for a discount or even a refund. Antique rug reproductions are available when budget is a concern. These look remarkably authentic and can serve the same purposes as an original. Prices vary per manufacturer, and differences in quality can be experienced. Through the many technological advances that have been made in the manufacture of area rugs today, much can and is being accomplished in design and creativity. Because of this welcome trend, reproductions have gained in popularity and have gradually become more affordable, making them a lot less expensive than their original counterparts. Of course, the investment value is also forfeited when one purchases a reproduction , but none-the-less, the design statement is still achieved and the end result is a room greatly enhanced with beauty and originality.